The final project for my Advanced Level Design class. The prompt was to take an already created mechanic and add onto it. In our case, it was the advanced car tutorial and we were not allowed to edit any of the physics. After playing around with the level that was provided, I noticed the physics were really bad and it was hard to keep the vehicle upright. I realized I could use that to my advantage and created a game based around that flaw. This originally was supposed to be one level, but it turned into more of a game prototype. I had too much fun making this so I added an extra level. Please see below for detailed information. 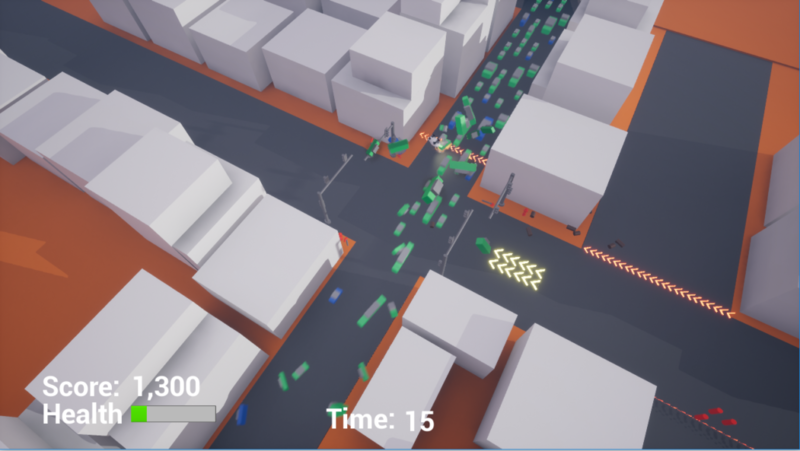 After messing around with the vehicle template, I came up with the idea of creating a few levels where the objective is to rack up as much points as possible by crashing into cars. I used the bad physics to my advantage when planning the core elements as it was really easy to make your car flip. 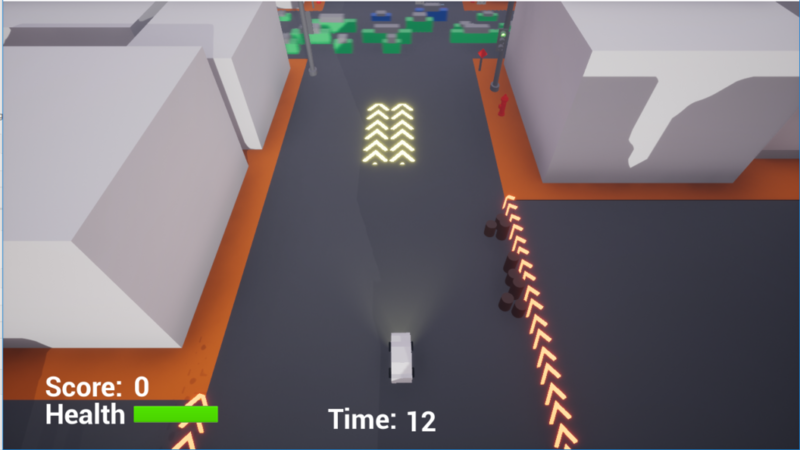 The game in itself is quite simple, with controlling the car the only mechanic (this could also be a good mobile game as the movement controls would translate well to touch). 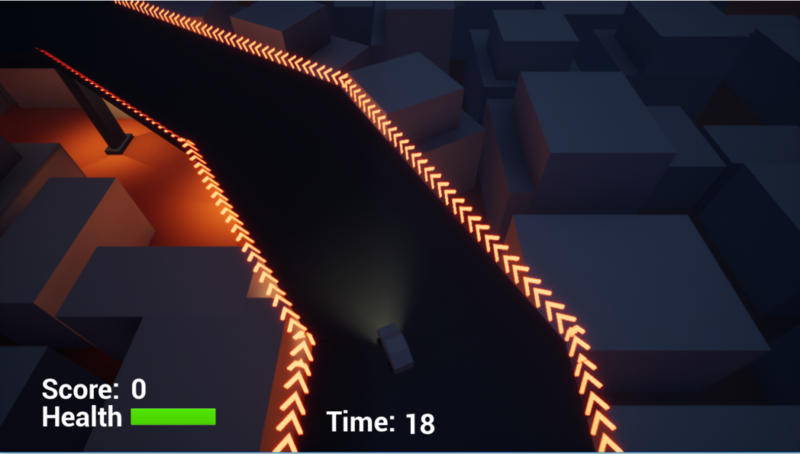 Cinematic level overview shows the player what to expect while they are driving to minimize confusion. 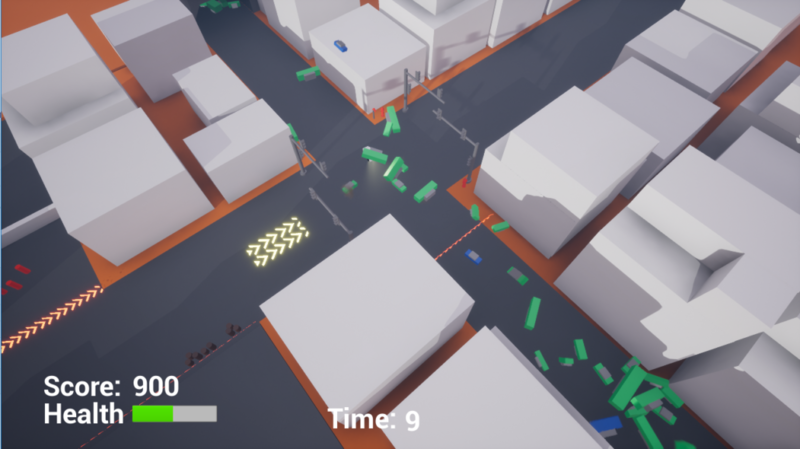 Various elements inside the level also help guide the player to the intersection where they are supposed to crash. Play testing helped me solidify the levels to make the objective very clear to the player. I cut a mechanic that caused confusion during play tests. This mechanic stopped all movement of the car when they initially hit something. 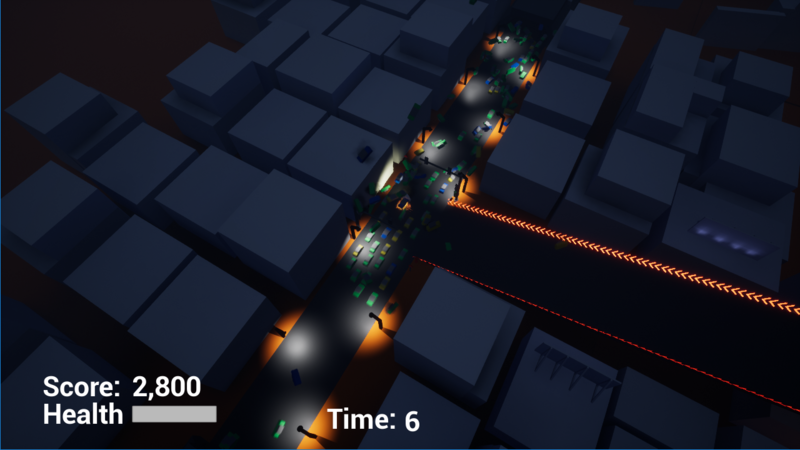 Most testers did not like this and wanted to continue to crash into things to get points. Testing also helped with level designs. My first level had multiple intersections and this was before the camera moved to an overview of the intersection, so it made sense to me. After testing, I noticed that players would sometimes not see the epic crashes that this game could create. By making sure there was only one main crash site, this ensured they would see it. I wanted to incorporate some script that would figure out which intersection had the best crash and move the camera there, but that was out of my scope. I would have also liked to have some visual feedback that came out of the cars when hit to show the score.